If your dining room space is limited, it would simply be unwise to look for large tables – even if you need quite a few seats from time to time. So, the best solution would be to shop for small dining tables that expand instead. Fortunately, the majority of UK and European furniture manufacturers realize that space optimization is of the essence, which is why it will not be difficult to find stylish and compact table arrangements for your dining room. Of course, your table size should be suitable for your dining room / kitchen. 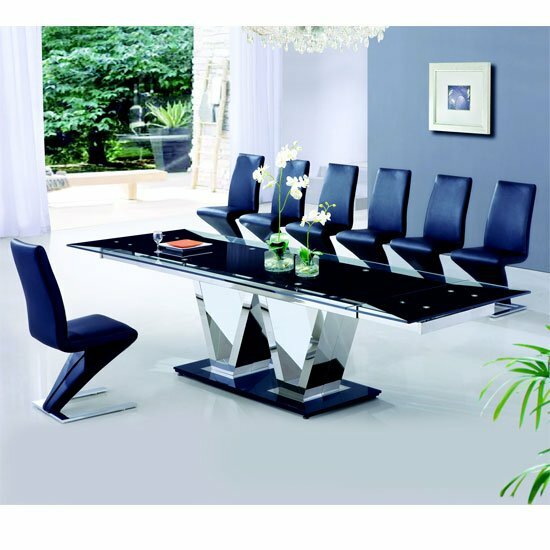 As a rule, a typical dining table can accommodate from 4 to 16 people. Also, consider the shape you need. For a square room, you should better stick to square table models. A rectangular room can have both square and rectangular tables – the choice is yours. Wood – a classy and elegant option for traditional environments; the selection varies from very light to extremely dark hues. The most common materials include oak, birch, walnut, and pine. The latter one is one of the most affordable options, while the first one can be quite expensive. High gloss – MDF furniture covered in shiny lacquer finish is extremely popular these days. It can fit into modern and mixed interiors; plus, it comes in many colours, and creates festive atmosphere in any room. Glass – a very contemporary option, designed for modern interiors. Looks amazing in a combination with metal, high gloss, and other glass objects. Plus, safety glass is very durable and is easy to take care of. There are dining room sets featuring a table and some chairs. However, the number of chairs might not meet your needs, so you may want to look for small dining tables that expand first, and purchase chairs afterwards. Also, do not forget that you may need matching display stands, cupboards, etc. The last tip – do not settle for a furniture piece that looks “ok”. After all, high quality furniture will most likely stay with you for years, which is why you should look for the arrangements that meet all of your requirements – both functional and visual ones. Of course, finding small dining tables that expand and satisfy all of your whims may require some time. However, you have a chance to save some time if you start your search with big furniture stores . The advantages of looking for a furniture piece in a big retail chain are impressive model selection, guaranteed quality from the established manufactures, and affordable pricing policy. So, if you do not want to waste your time and money, try hitting a big furniture store!